Data for the first three graphs is from NOAA. This is graph of the percentage of possible sunshine that a bunch of cities around the United States get in an average year. As you can see, Albany is very much to the less-sunny side of things. 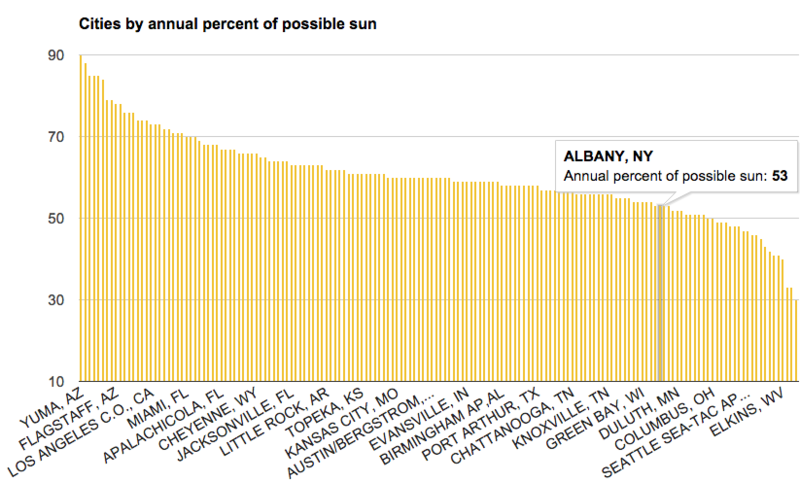 Here's a breakdown of the percentage of possible sun that Albany gets by month, on average. That July and August are the top two isn't really surprising. 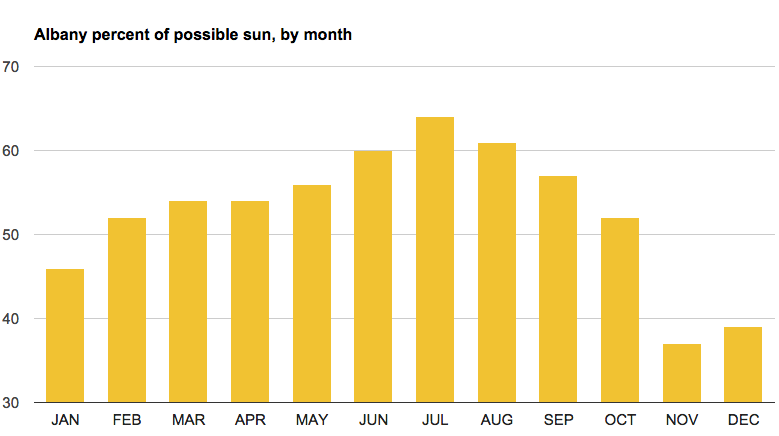 But we were surprised just how sun starved November and December tend to be. Yikes. A different way of looking at this question is cloudiness. 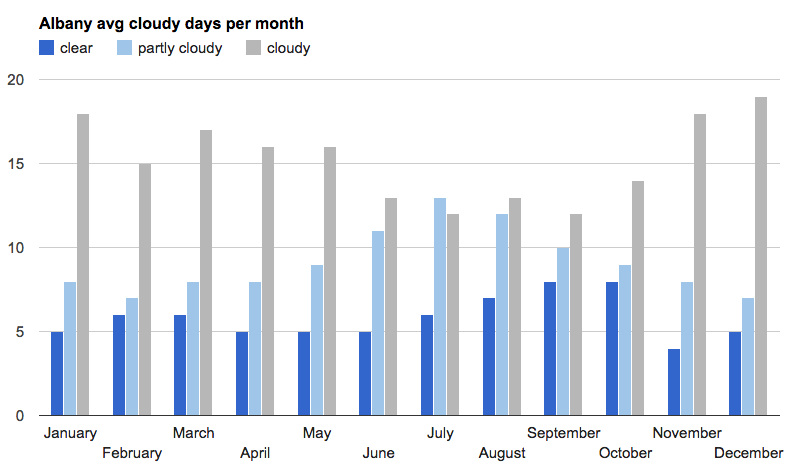 So here are Albany months with the average number of days that are "clear," "partly cloudy," and "cloudy." It was a bit surprising to us that the months with the most number of outright clear days are September and October. 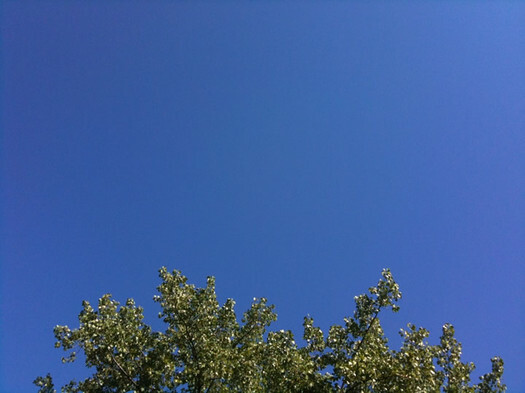 Maybe that explains why when we think of autumn here we tend to think of brilliantly blue skies. This last map depicts something a bit different, but we thought it was interesting (and, uh, pretty). 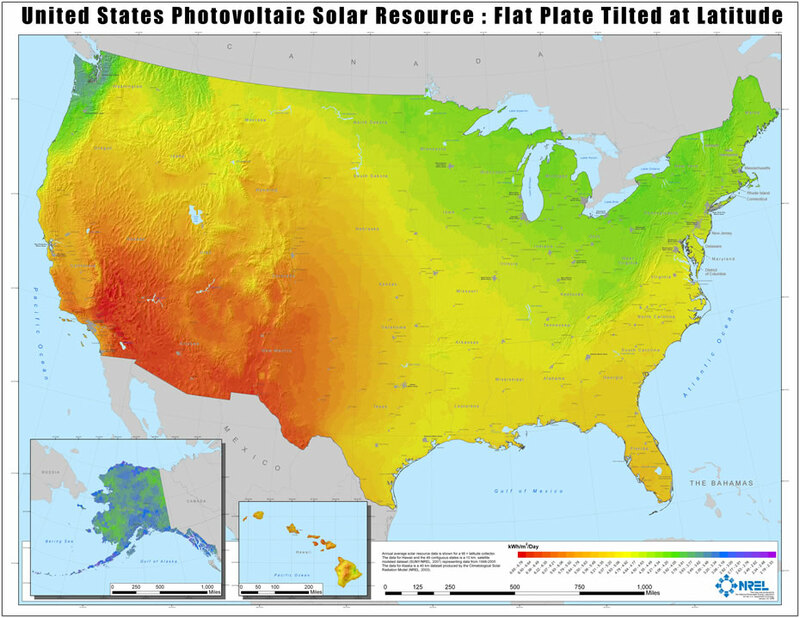 It's a map created by the National Renewable Energy Lab depicting the daily average potential for collecting solar energy around the country. While this isn't necessarily a measure of "sunniness" exactly, it does suggest that among upstate New York cities -- many of which appear on the less-sunny side of that first graph -- the Capital Region is among the sunniest spots. This post is basically just a bunch of graphs. They're above in large format -- click or scroll all the way up. Interesting stuff. I also was intrigued by the clear skies peak in September/October. Maybe that is part of why fall is so nice around here. And then look at that precipitous drop-off into November.. :( Don't want to think about that yet.